Gift Certificates may be redeemed for purchases made at the Team FAASST Online Store and may also be redeemed as a credit towards any scheduled FAASST Performance Driving School, FAASST Track Program, or FAASST Lapping Days event. 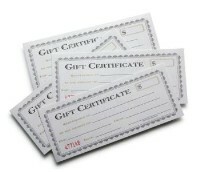 Gift Certificate purchases are non-refundable and certificates are good for one year from date of purchase. Payment is due at time of purchase. A $1 mailing fee is added for each certificate purchased. Please type a mailing address for the certificate in the option box.